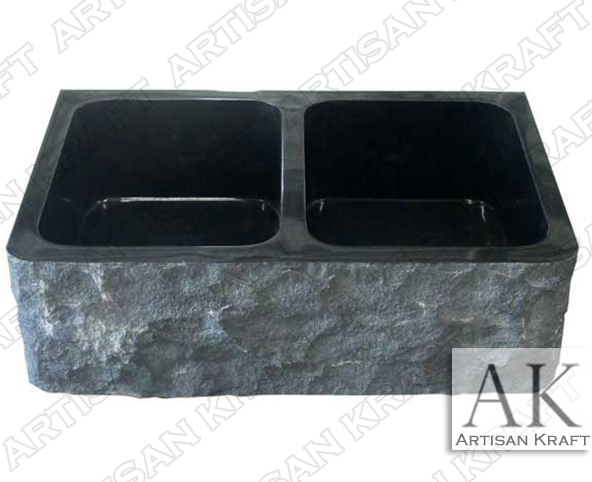 Black marble farmhouse sink with two basins carved from black marble. The rough and rugged exterior of the sink is contrasted by the smoothly polished black marble on the inside of the two basin sink. The two bowls are the same size but you can have them made different sizes. This farmhouse sink is fully customizable. These are carved from solid real stone and are very durable. It can be installed flush with the counter or as is trending right now can by under mounted below the counter edge. We also offer a great selection of these farmhouse copper kitchen sinks.